On Saturday, the men’s and women’s track & field teams competed at both the Iowa State Classic in Ames, IA and the Valentine’s Day Invitational in Boston, MA. At the latter, the men’s middle distance runners were particularly impressive. Senior Spencer Brown, senior Nick Wareham, and junior Jack Salisbury all recorded personal bests in the mile run and finished in the top 20 out of a field of 278 runners from various schools. Brown, an All-American from Wilton, CT was the fastest of the bunch, finishing 12th just under the elusive four-minute mark with a time of 3:59.97. Brown will look to build on that performance when the team heads to Winston Salem, NC and South Bend, IN next weekend for the JDL Fast Track Invitational and the Alex Wilson Invitational. The No. 22 women’s lacrosse team kicked off its 2019 campaign on Saturday with a matchup against St. Joseph’s in Philadelphia. 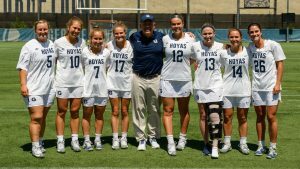 Three Hoyas notched hat tricks on the afternoon, with senior attackers Taylor Gebhart and Morgan Ryan and senior midfielder Francesca Whitehurst all making their presence felt in the 12-9 victory. Gebhart, a 2018 First Team All-Big East selection, also notched four assists in a busy offensive performance. The Hawks took an early lead, but Gebhart found an opening for freshman midfielder Katie Crager, who tied it up. When St. Joe’s regained the lead midway through the first half, it was Gebhart again who helped bring it level, this time with an unassisted goal. The teams went into the break tied at six, but the Hoyas soon took over the game with a 5-0 run to open the second half. Gebhart had two assists and two goals during the dominant stretch which effectively ended any Hawks hopes. Georgetown’s home opener against No. 11 Towson is next Saturday. The men’s tennis team had a solid week, picking up a pair of 4-3 victories: over George Washington on Friday, before taking down Xavier on Sunday, for its first two wins of the 2019 season. Sophomore Rohan Kamdar was a key factor in that success. Against the Colonials, Kamdar established an early lead for the Hoyas along with his doubles partner, sophomore Connor Lee, as they took down the freshman duo of Ben Barnett and Zicheng Zeng, 7-5. Zeng would get the better of Kamdar in two sets of singles action, but Kamdar came back with a vengeance on Sunday against the Musketeers. Once again as the No. 1 doubles duo, Lee and Kamdar scored a dominant 6-2 victory over senior Jack Dykema and sophomore Brett Winters. In singles, the Singaporean had a tough No. 1 battle against Winters. Kamdar dropped the first set, 5-7, but strengthened as the match progressed, winning the second, 6-4, and the final set, 6-2, for a perfect day. 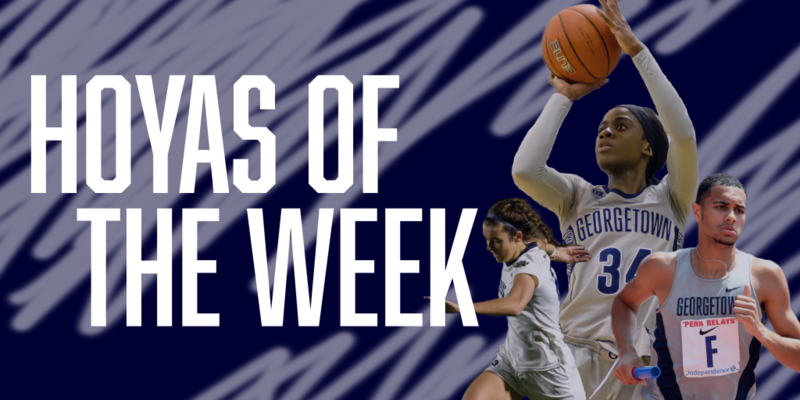 The Hoyas take on Longwood at Yates Field House on Thursday. Throughout this men’s basketball season, sophomore guard/forward Jamorko Pickett has tended to take a backseat offensively, making way for the freshman guard duo of Mac McClung and James Akinjo to dominate the scoring column along with senior center Jessie Govan. Despite a three-point dip in his scoring average from last year, Pickett has quietly seen his shooting efficiency improve while his other stats such as rebounds, block, and steals have all increased. This week, he reminded fans that he is still an offensive threat, especially from deep. In the Hoyas’ win on Wednesday at the Dunkin Donuts Center in Providence, Pickett was a perfect 4-of-4 from 3-point land, for 12 points. In Georgetown’s four-point loss to Butler on Saturday, he was back at it with 18 points, including three 3-pointers, and also grabbed five rebounds. On the week, he shot an extremely efficient 11-of-17 from the field.